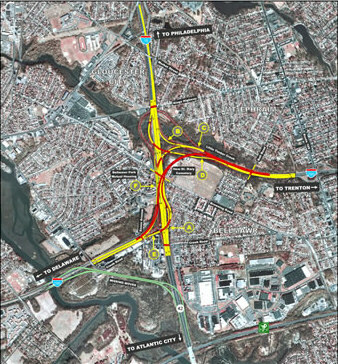 Alternative G2 begins in the vicinity of the Grenloch Secondary Railroad Bridge over I-295. The southbound and northbound lanes of I-295 align over top of each other as an over–and-under viaduct and shift south. The I-295 viaduct alignment is elevated to cross over all of the ramps as well as I-76 and Browning Road. I-295 crosses over I-76 on a skewed alignment and then diverges and lowers in elevation to meet the existing I-295 pavement following the same alignment as in Alternative D to a point just north of the Creek Road Bridge. I-295 southbound is a fourth level viaduct and northbound is a third level viaduct at the Route 42 and Browning Road crossings. I-295 southbound passes over Bell Road, whereas, I-295 northbound passes under Bell Road. Vehicles on Route 42 whose destination is I-295 northbound, exit on Ramp A. Ramp A crosses under Ramp E and then crosses over Route 42 northbound before joining the elevated I-295 northbound alignment just north of Browning Road, similar to Alternative D.
I-295 to connect with Route 42 north of the Creek Road Bridge. Northbound I-295 traffic heading north on I-76 utilizes Ramp E which follows essentially the same alignment as it does now. Southbound I-76 traffic heading to I-295 southbound utilizes Ramp F. Ramp F diverts from I-76 from the right (existing exit is from the left), and then passes under Browning Road. Ramp F first runs parallel to Ramp C and then runs adjacent to I-295 southbound. Ramp F rises from a depressed section at Browning Road to an elevated structure as it ties into I-295 southbound prior to Essex Avenue.